This is the judges final virdict of Bridget Bishop. 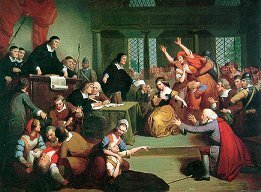 We the Honorable Judges, John Hathorne and Samuel Sewall, find the accused, Bridget Bishop, innocent of the charges of witchcraft. Based on the evidence provided, we have come to this common, conclusion that Bridget should be acquitted of these accusations. There are many factors supporting our decision. Bridget Bishop has remained loyal to the church and our Lord even after the death of her husband George Wasselbe. Her third husband, Edward Bishop, was a founder of the Beverly Church. This leads us to believe that a close proximity to God did not bother her at all. Moreover, she adhered to the bible very strictly even compared to her ordained husband. She wore a red bodice as a sign of the blood of Savior Jesus' sacrifice, and a black hat and cap in remembrance of his death; this signifies her close relationship with the Lord. She even opened a restaurant to hold devotionals within her own walls. In conclusion we will release her from our confines out into society to live for the Lord and be happy.